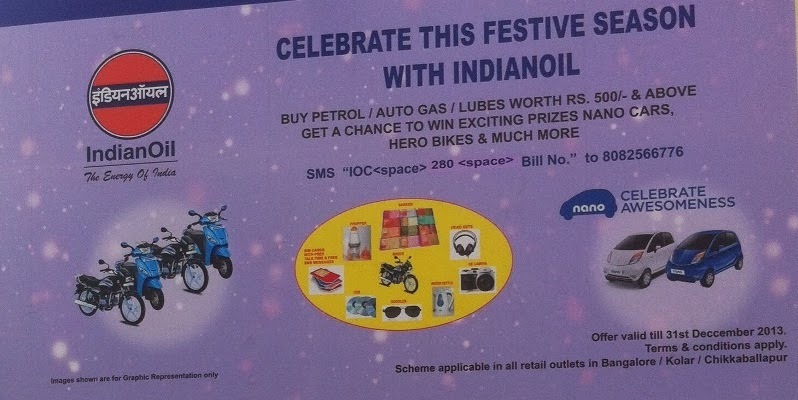 Indian Oil Corporation (IOC) introduced a new promotion campaign called "FILL MAADI WIN AAGI". If you are filling you fuel tank with Rs.500/- then you are eligible to participate in the campaign. There are lots of prizes waiting for you including 4 Tata Nano cars, Hero bikes, daily gifts etc. You have to get the electronically printed bills from the fuel outlet and send an SMS mentioned in the format mentioned in the fuel station. The campaign is till 31st of December 2013. You have to keep the Original bills to claim the prize. Participate and win the gifts.